I fully believe that making memories is more important than collecting things. But what happens when certain “things” are emotionally connected to memory-making, especially for children? 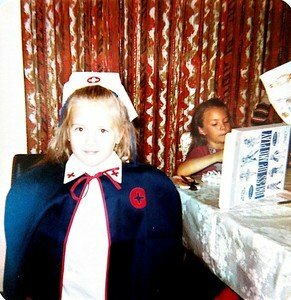 When I was a little girl, I wanted to be a nurse. It was an obsession that lasted a number of years. I had a darling dress-up nurse costume I wore at Halloween and every other opportunity. My grandma, who worked at a college where there was a nursing program, even went the extra mile to get me a “real” nurse’s hat. It was awesome. I carried around a bag proclaiming, “I wish I were a nurse,” with important nurse accessories inside like medicines, a glass thermometer (standard then, not so much now) and Band-Aids. By the time I declared my passionate intention to be a nurse to my 2nd grade teacher, she had already recognized that I was (OK, am) an overachiever. She told me I needed to go to medical school and become a doctor instead. That was enough for me, and becoming a doctor remained my goal until my first biology class… which was when I realized I would much rather dissect paragraphs and policy than once-living creatures of any kind. But back to the bag. It contained childhood dreams and aspirations. And for 30+ years, that bag and its contents have been waiting to be loved by my own daughter. As we went through a box of my childhood toys, I was so excited for her to be thrilled about my red nurse bag. At 7 years old, I figured she was just the right age. D.I. is short for Deseret Industries, a thrift store where we donate our outgrown toys and clothes. Apparently storing it all these years was presumptuous and unnecessary. So I guess this is farewell to the nurse bag. But the memory now lives on through the written word and picture captured here. She may not want the bag, but I do want the memory. And perhaps she will, too, one day. So I’m curating it here, and recognizing the importance of collecting memories, not things. That has become a focus for me the last number of months, working to simplify and avoid collecting more “stuff,” opting instead to make memories together for birthdays and holidays, etc. I have spent time culling and purging, though I still have a long way to go. I feel good about this path and the effort to streamline. Enter the bin of Halloween decorations. ME: [in my head] It’s ugly and store-bought and we have too much stuff! And is that really where it always goes? Wow. how do you remember that? Big brother- though older and tougher and not sentimental- surprised me by heartily agreeing with Little Sister that each of the decorations, including ugly and non-sentimental ones, needed to be placed in the exact spot they remember. It is more important to save memories than stuff. BUT sometimes it’s the stuff that makes the memories. Right? Apparently my children’s memories of this holiday are attached to some of our stuff. What are your thoughts? 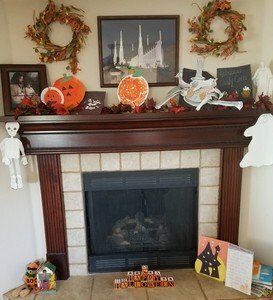 I’d love to hear how you prioritize memory making and your philosophy about the myriad of “stuff” that makes memories in our families, especially around holiday traditions and decor. Let me know what you think. Comment below or find me on Instagram to connect.